To avoid running out of your regular medications and interrupting your treatment, we ask for your cooperation in keeping track of your prescriptions. Please book an office appointment 6 – 8 weeks before you need to renew your prescriptions. Keep track on the calendar when the Pharmacist tells you the status of your refills. Plan ahead for holidays – check with the Pharmacist for the availability of refills and book an office appointment if necessary. Patients who have been referred to Dr. Sean Ebert or Dr. Alison Fine for a consultation about having a colonoscopy or gastroscopy must view an informational video. The video provides general information about endoscopy, how to prepare for the procedures, and addresses many of the FAQ about having these procedures done at the hospital. Please click here to view the video. All are welcome and you are encouraged to bring a family member, friend or loved one. The Omineca Medical Clinic has been proudly serving the health care needs of Vanderhoof and the surrounding area for the past 49 years. Since opening our doors in 1969, the Omineca Medical Clinic has been dedicated to providing timely, professional, and expert care for patients. As a full service Family Practice, our medical team is committed to helping patients achieve optimal health and wellness. We offer a full range of health care services to our patients including the management of acute and chronic illnesses for people of all ages, preventative medicine, prenatal and newborn care, minor office procedures, and group medical appointments. Please feel free to contact us at any time if you have any questions or concerns. It feels like it has been a long winter but clearly spring has finally arrived in Vanderhoof. Things are getting back to normal now that the flooding damage at the SJH OR has been repaired. 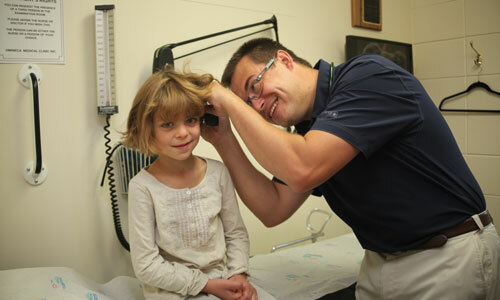 The Clinic continues to be busy but having a full complement of Physicians since the fall has been a plus for patients. We have more open appointments and wait times for the next available appointment have often been much shorter. In the broader picture, the Physicians and staff at the Clinic continue to work in partnership with the Northern Health Interprofessional team to deliver team-based patient care. A new patient handout has been developed that provides information on the shared electronic medical record. Another exciting development in 2018 has been the start of a regular High School Clinic for youth at N.V.S.S. Running every Wednesday morning, students can be seen by a Physician at N.V.S.S. until the end of school year. The Clinic has been quite successful and the Physicians hope to continue the service in the fall of 2018.